We keep fittings for half round grey 112mm guttering and round 68mm grey downpipe. Grey 112mm half round gutter 45 degree elbow. 112mm half round gutter 90 degree elbow. Grey bracket / clip for 112mm half round gutter. Half round grey 112mm gutter external stop end. 112mm gutter internal stop end. Fits into a guttering fitting to blank it off. 112mm gutter joint / support bracket. 112mm half round gutter running outlet. 68mm rainwater downpipe 112.5 degree elbow. 68mm rainwater downpipe 92.5 degree elbow. Pipe clip / bracket to suit 68mm rainwater downpipe. 68mm rainwater downpipe shoe. This is the outlet piece for your rainwater downpipe. 68mm downpipe tee with 112.5 degree branch. 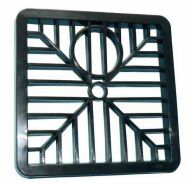 This square drain grid is manufactured from plastic and fits drains 6 inches in size. Prevents debris falling into gully.